I had dinner with a few college friends and one of our SJSU computer engineering professors to catch up! We went to the Sa-By Thai in Downtown on 2nd St; they have another location on 7th St. Yep, Sa-By Thai has two locations within 5 blocks…so double check which location you’re meeting up at! I frequented the 7th St location when I was attending SJSU and always ordered their “BBQ Eggplant Salad”. So of course, I ordered this dish for my dinner! I love eggplants and salads, so the two combined must be good, right?! 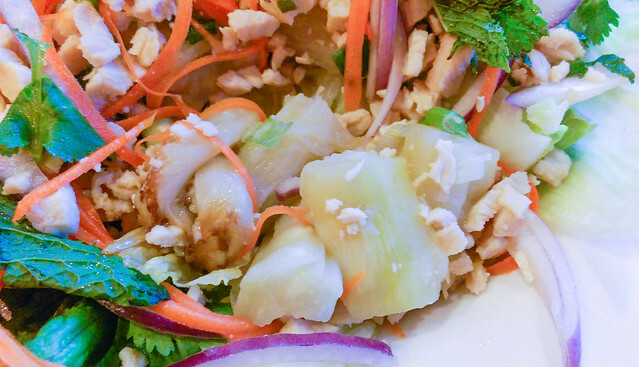 The eggplants are grilled and mixed with shrimp, ground chicken, red onion, green onion, lime juice, and chili. You can eat the BBQ eggplant salad on its own, or with steamed rice. Here is a closer look at the grilled eggplants; the skin has been peeled off. The traditional version of this dish […] calls for roasting the eggplant whole and then combining the soft, smoky-flavored flesh with [chili, lime, and fish sauce dressing and some fresh herbs] in addition to dried shrimp and boiled eggs. It really is an awesome salad, mushy roasted eggplant innards, eggs, and all. The mild sweetness of the roasted eggplant plays well against the strong, bright flavors of lime, chili, and fresh herbs. And somehow the egg adds substance that you didn’t even know was missing, with the end result being a wonderfully light, yet completely filling Thai salad. This is another of those wonderful dishes that should be on all Thai restaurants’ menus. Powdered dried shrimps [can be used] but grilled prawns will work beautifully with the smokey and silky eggplants as well. 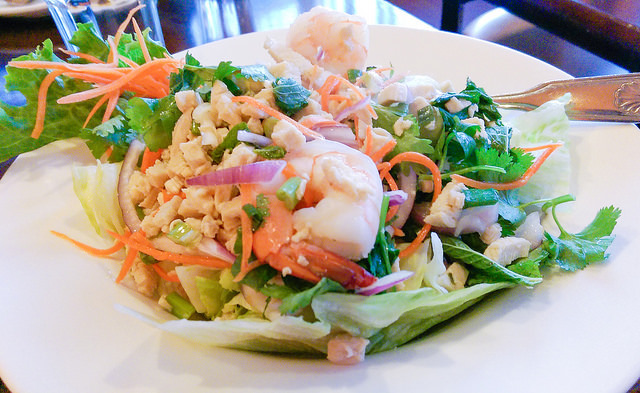 Another thing I must clarify is – Thai salads are generally served as part of a Thai meal with plenty of steamed rice, rather different from the western notion of what a salad is. the name says it all! “Yum”!! !